I arrived at the Vermont Womenpreneurs Spring Showcase, on June 13th, at the end of a very long day. By the time the Showcase began at 6 p.m. I’d been working 13-hours, balancing caring for my two children with my fledgling business. And I was feeling like both were getting short-changed. Honestly, I felt a little uncertain when I walked into Study Hall, where the event took place. The room- an open space with exposed brick and wooden beams with windows overlooking downtown Burlington- was full of stylish women in dresses­ and jumpsuits, hair arranged, strappy sandals affixed to manicured feet. I’d chosen my worn jeans and linen top because I feel like myself in them; suddenly I wondered if I belonged in that beautiful space with all these polished, accomplished women. Then the showcase began, and my fears evaporated. The first presenter, leadership coach and career strategist Joanne Jastatt, was immediately relatable as she recounted her thoughts on leaving her job a year ago to focus on her own business. “Why would I leave a job that I like, that pays well, and is stable? But that’s what I did!” she laughed warmly. I smiled in recognition and relaxed into my seat. I was definitely in the right place. “Why would I leave a job that I like, that pays well, and is stable? Almost two years ago, I left a successful career as an in-house content strategist (a role I actually created for myself), so I could stay at home with my new baby. I’d hated going back to work after my first and saw this as my last opportunity to soak up every minute of new babyhood. Within four months, though, I was freelancing. I loved my new baby, but I also really loved my work, much more than I’d realized. And, as it turned out, I really enjoyed the new freedom that freelancing provided. Soon I had a number of regular clients and was making good money. So it was time to get serious. I came to the Womenpreneurs Showcase hoping to glean inspiration as well as practical advice, and to figure out next steps for building my work into something substantial. Mieko Ozeki, womenpreneur of Radiance Studios, LLC and showcase producer, organized the event to “convene women business owners, publicly promote their businesses, and carve out opportunities for participants to connect and collaborate with one another.” She really nailed it. There were 20 presenters in total and each person was allotted five minutes to speak. The format kept things fresh while still allowing for some surprising depth. 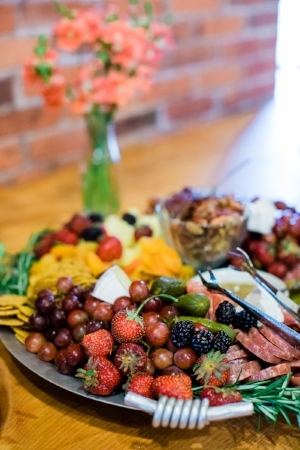 The delicious food, provided by presenter Katie Baas of Lucky Star Catering, kept people happy and well-fed. The presenters were funny. They were bold. They were honest. And, above all, they were REAL. We heard stories about businesses on the verge of collapse; about working second jobs to keep passion projects afloat; about the grit and determination these women discovered in themselves, and how even still, some days can feel overwhelming. Marketing Strategist Julia Atherton spoke about the importance of being weird. Of being unabashedly yourself, since it is your uniqueness that differentiates you. Her message struck a chord with me. Last winter, I took a risk on a new client, injecting some quirky humor into their web copy. They loved it and they are now one of my biggest clients (not to mention one of the most fun to work for). Even still, it can be hard for me to relax into myself, my quirks. But presenter after presenter kept hitting that note – that it was listening to and honoring those differences in themselves that led them down these rewarding and successful paths. We kept hearing words like vulnerability, struggle, compassion, community. We heard about kids at business meetings and tired boss-ladies spending nights sleeping at work. There was so much honesty and bravery on display – and so much generosity in that honesty – it became apparent that there is something magical about women in business. What emerged from the evening, more than anything I think, was this strong sense that women possess some exceptional powers. Not only in our qualifications and experience... but in our ability to be whole, flawed, failing, flying, still forging ahead, and all the while maintaining our connections with the rest of the world. Women have never had the luxury of leaving their families behind; of creating a clean divide between home life and work life. We are, by and large, the people who manage all the little things that must get done. We must balance, “having it all” so others are cared for, especially if we decide to have children. Rachael Salerno, a current Middlebury College student and co-owner of Share to Wear, emphasized this point in her talk when she mentioned that the wage gap between men and women starts to grow exponentially after the birth of the first child. Following your own plan offers an alternative – a plan not just tolerant of family life, but informed and even driven by it. Like Ashley Reynolds, who turned to CBD in 2017 to help her cope with postpartum anxiety. She was so moved by the way it healed her, allowing her to get back to herself and be present with her small children, she was inspired to then share the experience with others. She gave up a career in dentistry to create Elmore Mountain Therapeutics– a well-known Vermont company that supplies locally sourced CBD to over 50 businesses. Not every presenter was a mom, but each was grounded in a sense of nurturing her community. Every business featured that evening included a strong sense of lifting up others. 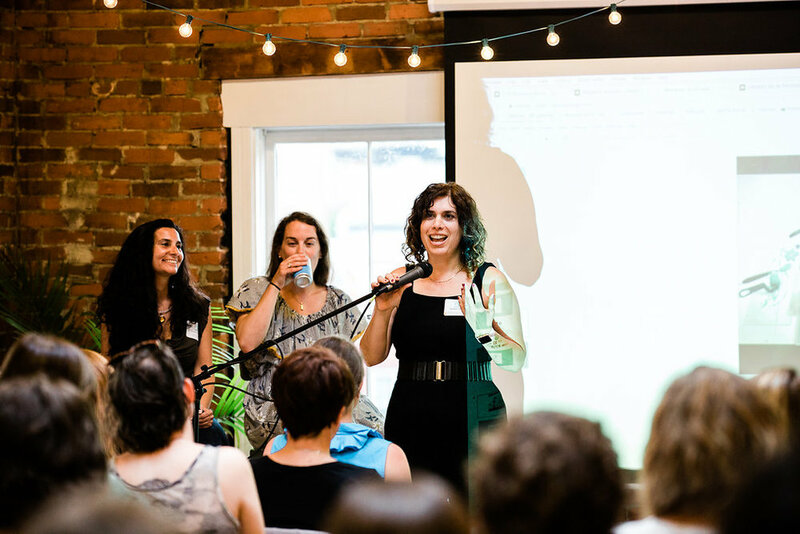 So who is Vermont’s Womenpreneur? If the showcase is any indication, she is a fierce human who is eschewing limits and forging her own path. In creating her own business, she is rejecting the notion that her worth must be defined by others. She is taking control of her own power, trusting in her ability to grow and share her gifts, and be compensated for them.